Updated Friday September 28, 2018 by Scott Childs. The MBA Select Program is a competitive basketball league that competes against other Dayton area select programs as part of the Dayton Metro League. 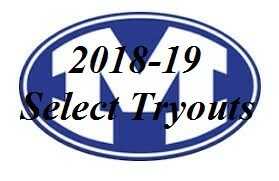 Players looking to play for a select team must attend at least one of the following tryouts (both tryouts are recommended) in order to be considered for a select team. Please note - there is an additional fee and time committment for any player who becomes a select player.